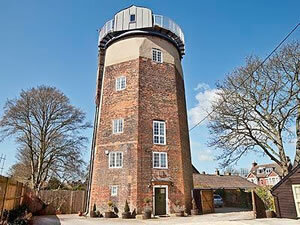 Enjoy a unique holiday in this detached windmill, built around 1800, now converted to provide comfortable spacious accommodation over 5 floors with spectacular views over the Chiltern Hills from the second floor sitting room. Used as a working windmill until 1900 and then the home of an actress and a music publisher, The Windmill, now minus its sails, is located in the historic market town of Wendover. Set in a quiet location, it has an attractive enclosed rear garden. Nestling in a gap in the Chiltern Hills the historic, picturesque market town of Wendover has a fine array of historic buildings, restaurants, shops and pubs; it also has a traditional market every Thursday. The area is blessed with a variety of walks through some of southern England’s most enjoyable countryside; the famous Ridgeway Path runs right down Wendover High Street. At nearby Coombe Hill, the highest point in the Chilterns, visitors can enjoy excellent views over the Vale of Ayesbury and the Chequers Estate, the Prime Minister’s country home. The Windmill is 18 miles from historic Oxford with its dreaming spires and famous colleges, whilst Wendover station is a 5-minute walk from The Windmill giving easy access to guests wanting a day in the capital city of London. Also conveniently located to visit Whipsnade Zoo and the Roald Dahl Museum. Shop 300 yards, pub 200 yards. Entrance hall. Dining room/well-equipped kitchen with breakfast area, TV and slate floor. Separate toilet. First floor: Double bedroom. Beamed twin bedroom with wooden floor. Wet room with toilet. Second floor: Spacious beamed living room with wooden floor. Third floor: Single bedroom with additional single pull-out bed (for +1) and fully-tiled en-suite bathroom with over-bath shower and toilet. Beamed single bedroom with additional pull-out single (for +1), wooden floor. Fully-tiled bathroom with over-bath shower and toilet. Fourth floor: Double bedroom (can be twin), wooden floor, dressing room and en-suite shower room with toilet. The Windmill is in or near Wendover in Buckinghamshire, Central England. *Please note all the details were correct when first published but please check with the owner/operator prior to final booking.